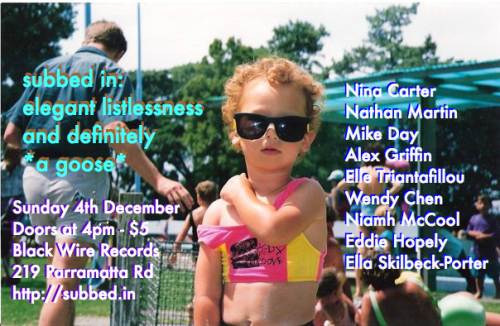 prepare for a chill arvo of literary performances this sunday at â€˜subbed in: elegant listlessness and definitely *a goose*â€™! we acknowledge that subbed in meets on the land of First Nations People - the Cadigal Wangal people of the Eora Nation are the traditional custodians of the land. we pay respects to elders past and present and acknowledge this land was never ceded, sold, or given up.